I believe that nobody has done more to raise these awkward questions within the Catholic Church than Cardinal Pell. It is an irony of our bewildering times that it is a courageous churchman who dares to question one of our society’s most entrenched dogmas – but that is exactly what he will do tonight. Any benefit apart from more money to governments via taxes and to whoever works in the AGW sector? Q: oil running out, new extractions make environment worse Q: Political divergence between Australian parties? A: pontifical academy of science also contains differing opinions Husbandry important but what are the facts? Q: did AGW replace Marxism? What right to keep poor nations poor by preventing use of fossil fuels? Q: AGW is taught as a fact Is that moral? Q: (inaudible) Q: important points made Opinion on Carbon tax? How can we help poor by taxing them? Congratulations to myself. I have just graduated to having a dedicated blog post by Skeptical Science no less. Surely I’m not yet in the Big League (the author over there is only honesty-challenged dana1981) but for the very same reason I can proudly describe myself now as a Big Minion! As for what SS has to say about my arguments …well, there’s little to discuss. That post sounds more like the umpteenth attempt to rally the usual, tired troops. Good luck with that. This might be the most important lesson of the 1974 report on global cooling: that we need to grow up, separate climatology from fear, and recognise — much as it pains politicians and scientists — that our understanding of how climate changes remains in its infancy. "BEST global surface temperature estimates. Gray bars show what BEST says are the 95% confidence intervals (95%CI) for each datapoint"
"The Special Report on Emission Scenarios (SRES-SPM-5) A2 projection from Figure 1 showing the physical uncertainty of the projected temperature trend when including ±10.1% cloud error (light shading), or the uncertainty in greenhouse gas forcing (dark shading). 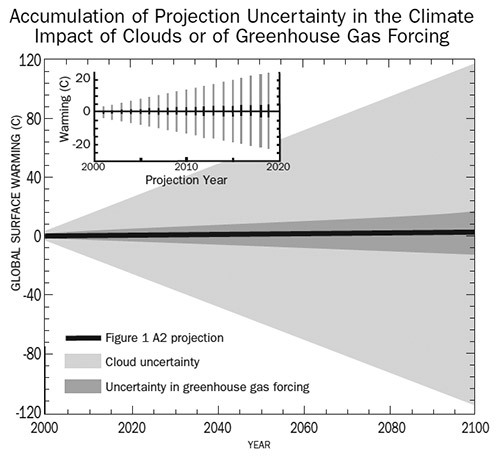 Inset: A close-up view of the first 20 years of the A2 projection and the uncertainty limits." In other words: for the past, all we know for sure it’s that the error bars cover from -5C to +3C if we go back to 200 years ago. For the past, all we can estimate for sure it’s that error bars cover an enormous span if we move forward 100 years (even removing cloud uncertainty, still the 2100 error goes from -10C to +16C). For all we know, Romans were conquering a world that was 50C colder than today, and oceans will boil before the XXII century. Or vice-versa. Please do not start speculating about uncertainty as a reason for doing nothing – it isn’t. Socrates was wise in that he knew the he knew nothing, whereas others were unaware of their own ignorance. One evening we unrolled the pen recorder data in a long ribbon down the corridor outside the main observing room. “Now,” he said, “look at the data. Get to know it.” His point was that before us was what the universe was saying, and that it was more important than any theory.” Data is never inconvenient. It beats theory every time. Tons of desperate journalists and bloggers couldn’t help themselves when talking about the Muller/BEST’s press release, and filled the net with what must have been one of the largest collective display of idiocy this side of the carpal tunnel syndrome epidemic of old (tellingly, even Tamino was too enthusiastic to bother reading things properly whilst RC’s Steig did, so poor Grant F felt compelled to busy himself in disagreeing with Muller about something). One of the most popular claims concerns the depiction of Muller as some kind of “reformed skeptic”, some pretty soul who’s finally seen the data, and the light alongside. Here’s the UK’s Independent repeating the party line, for example. Professor Richard Muller, a physicist at the University of California, Berkeley, who has been an outspoken critic of the science underpinning global warming, said that there is little doubt in his mind the phenomenon of rising land temperatures is real. Well, I can now report (with no worry of being refuted) that Richard Muller has been a climate skeptic all along. And he has not. At the same time! The important point, in fact, is the definition of “climate skeptic”. In a saner world, a “climate skeptic” would simply be any person approaching the field of climate change with a critical eye, and especially about the more outlandish claims of impending catastrophes caused by humans burning “fossil fuels” and doing all the other nasty things humans do. Of course, in a saner world 99.999% of the people would be “climate skeptic” and there would be little or no discussion about “global warming” or “climate change” being the “the world’s greatest challenge“. the worst effects are still ahead of us. Coming back instead to the insane world we live in, definitions change. In particular, in the eyes of AGW True Believers a “climate skeptic” (aka “climate denier”) becomes anybody that questions anything about the IPCC-led climate change orthodoxy. And by that I mean, anything. It doesn’t matter if one surmises the world has been warming (the very definition of “global warming”), and that humans are “very likely” causing that (the very definition of “anthropogenic global warming”): all it takes is an expression of uncertainty or doubt about whatever topic, and immediately the brainless hordes will descend in full fascistic gear. In fact, much of what you hear every day is exaggerated, often on purpose. All in all, it looks like nobody knows who Richard Muller actually is. Expect surprises. We’re already susceptible to natural variations so why poke the system? Climate change “uniquely vexatious issue” – massive changes, people against it as governmental interference. Q&A peak carbon? Huge amount of accessible coal. Q&a: overpopulation? Important point but politically challenging. Apparently I have inspired with my “sea wall question” a great answer about risks and uncertainties. Question challenges CO2 consensus. I find these useless in this context. Q&a what if one believes in AGW but also in free markets? Are alternatives going cheaper? Looks for optimistic ending …people feeling powerless? Group helps you send message to MPs about climate change. 400k did. is that activism? Some additional considerations are at Bishop Hill’s blog. I hope I’ll have some time to elaborate, especially on Rapley’s seemingly inconsistent behavior between the BMJ conference on Oct 17, and the IOP speech two days later. Plenty of brouhaha everywhere about the pre-pre-pre B.E.S.T. papers. Ignorant reactions undoubtedly already abound. I surmise that the four pre-pre-pre-papers will get torn to pieces in the next few days (here’s my biting off the UHI article, followed by Steven Mosher’s). The quality of the BEST work will be measurable in the way they will react to that ( (a) making the necessary adjustments, (b) ignoring the lot, or (c) circling the wagons). The jury is still much out. In the case of Anthony Watts, so far it’s been a strong (b). Assuming B.E.S.T. is not a collection of unprofessionals, such a reaction makes little sense. Read what you write Judith! A PR strategy! Did Bohr have a PR strategy, or Maxwell, or Dirac. The BEST PR strategy is not the best PR strategy because it became so important as to become visible. It’s THE news, as you can read at WUWT. And a total failure: science takes once again the back seat, and who cares if BEST does it for visibility rather than politics? No placebo pill will ever work if it’s got “PLACEBO” written on it: likewise, no PR strategy will work if it’s so much in-your-face to its potential audience.